Richard Pedranti Architect (RPA), a full service architecture firm focusing on energy efficient design, broke ground last month on what will be the first Passive House in Pike County, Pennsylvania. New to the United States but common in Europe, Passive House is today’s most energy efficient building standard. 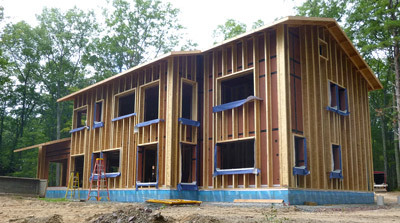 This will be the firm’s second Passive House residence in Northeast Pennsylvania. The first Passive House to be completed in Pike County, PA will be owned by Tom and Lynn Keffer. The couple found RPA while searching the internet for area architects. Richard joined Tom and Lynn on a tour of the area they had chosen for their project in order to develop housing plans that would respect the surrounding forest and community. After accessing their lifestyle aspirations, Richard introduced Tom and Lynn to the Passive House concept. The concept piqued their interest, and after they learned more about the advantages of building to Passive House standards, they decided this would be the perfect fit for them. A Passive House conserves energy by creating a virtually airtight, super-insulated compact building enclosure that uses the sun and heat emanating from humans and equipment to achieve a comfortable indoor environment. Underneath the foundation’s concrete slab lays 12 inches of EPS foam and 8 inches of Pennsylvania perlite, completing the super-insulated foundation. Aside from the thick layer of insulation that sits beneath the home’s foundation, the walls and roof will be wrapped with three times as much insulation as today’s standard home, reducing heating and cooling loss. Another critical component in maintaining the airtight enclosure is high performance windows and doors, historically weak links in a building’s thermal defense. RPA has specified Intus Windows, a pioneering manufacturer and distributor in super energy-efficient windows and doors. The triple pane Intus Windows perform 3 times better than typical windows while capturing maximum solar energy from the sun. After the triple-pane windows and doors are installed, the next step is to install all mechanical components, including the heat recovery ventilator (HRV), or what Richard describes as the “lungs of the house.” The HRV provides the house with a constant supply of filtered, fresh air, while also saving the homeowner money by reclaiming indoor energy that would otherwise be lost. This creates a huge upgrade in indoor air quality while maintaining consistent comfort. Throughout the building process, the Passive House will be tested a number of times using a Blower Door Test – a mandatory technique ensuring high building performance. The blower door is a fan that mounts to an exterior door opening. The powerful fan pulls all of the air out of the house exposing any leaks in the exterior walls. If any leaks are detected, RPA uses a special tape to seal the airtight building enclosure. The Keffers’ Passive House is currently scheduled for occupancy by spring of 2016. The cost of construction is estimated to be 0-10% more per square foot than typical new home construction. The house may cost a bit more on the front end, but the Keffer’s can expect to see the savings on their monthly utility bills, with heating and cooling cost dropping by 80-90% per year as compared to typical home construction.